Sgt. Frederick Joseph Earle, RAFVR 1332585 – Mid Upper Gunner. Killed age 22 on the 21st of April 1943. Son of Frederick Earle, and Stepson of Edith A. Earle, of Guildford, Surrey. Buried Esbjerg (Fourfelt) Cemetery, Denmark.. Grave location – Coll. grave A. 11. 11-14. Nine aircraft were detailed to attack the above targets with bombs of 1000 lb and incendiaries of 30 lb and 4 lb. Eight of the aircraft successfully attacked the target area. Some very large scale fires were seen but the attack was spoilt by a smoke screen which partly obscured the target. A.A. Fire was mainly confined to light tracer which was ineffective. Stirling Mk.III BF.518 captained by Sgt. Dalzell, collided with a Lancaster aircraft after leaving the target, and fortunately only slight damage was caused to the rudder and fin. After this hazardous experience he returned to base and made a perfect landing. Some enemy aircraft were seen in the target area, but no combats took place. The weather was very good and visibility was excellent. Navigation was very good. Stirling Mk.III, captained by P/O A.G. Tolley, failed to return. P/O Alan Gray Tolley, RNZAF NZ411954 – Pilot. F/S William Henry Ellis, RAFVR 1021328 – Navigator. Sgt. Frank Wakefield Upton, RNZAF NZ404430 – Air Bomber. Sgt. Cyril Thomas Cobb, RNZAF NZ412315 – Wireless Operator. Sgt. Gerald Albert Raymond Town, RAFVR 1217965 – Flight Engineer. Sgt. Ian Charles Salt, RNZAF NZ404046 – Rear Gunner. Stirling Mk.III BF506 AA-P took off at 22:05 from Newmarket. It was last heard on W/T at 03:00 signalling ‘starboard inner on fire’. Nothing further was heard, and the Stirling crashed at 03:26 at Boegballe, 15km North of Vejle, Denmark. It’s demise is reported as having been caused by a night-fighter attack. All rest in Esbjerg (Fourfelt) Cemetery. Lost without trace age 29 on the 12th of March 1942. Son of John Kilgour Earle and Mary Ann Earle, of Onehunga, Auckland, New Zealand. Grave location – Panel 115. F/S Patton Mason East, RNZAF NZ426083 – Navigator. Killed age 29 on the 24th of October 1943. Son of Frank and Clara East; Husband of Rieka East, of Dunedin, Otago, New Zealand. Buried Cambridge City Cemetery, Cambridgeshire, England.. Grave location – Grave 14523. Two aircraft were detailed to carry out the above operations with mines of 1,500lbs. One aircraft returned early owing to navigational failiure and the other aircraft dropped its mines, but on return as, apparently about to land, it crashed 1 ½ miles S.W. of this aerodrome and almost instantly caught fire and burnt out. The Captain, F/SGT. J.R. RANDLE and the Navigator F/SGT. P.M. East, the Air Bomber Sgt. J.J. Purves and the Wireless Operator F/Sgt. W. R. MYHILL were killed. The Flight Engineer, SGT. I.E. James and the Rear Gunner, Sgt. E.H. Bissett were admitted to R.A.F. Hospital, ELY. The Mid-Upper Gunner was uninjured. F/S James Robert Randle, RNZAF NZ416539 – Pilot. F/S James John Purves, RNZAF NZ422207 – Air Bomber. Sgt. William Raymond Myhill, RAFVR 1392196 – Wireless Operator. Sgt. I.E. James, RAFVR 1850021 – Flight Engineer. Sgt. W. Ramsay, RAFVR 1570005 – Mid Upper Gunner. Sgt. Stuart Richard Bisset, RAFVR 1473254 – Rear Gunner. Stirling Mk.III EF142 AA-C overshot the runway on landing at base and an attempt was made to go around again at 300ft. The aircraft crashed and caught fire, South West of the airfield. The Pilot, Navigator and Wireless Operator died, and the Air Bomber succumbed the following day. The Flight Engineer and Rear Gunner escaped with injuries. The mid upper gunner escaped uninjured. 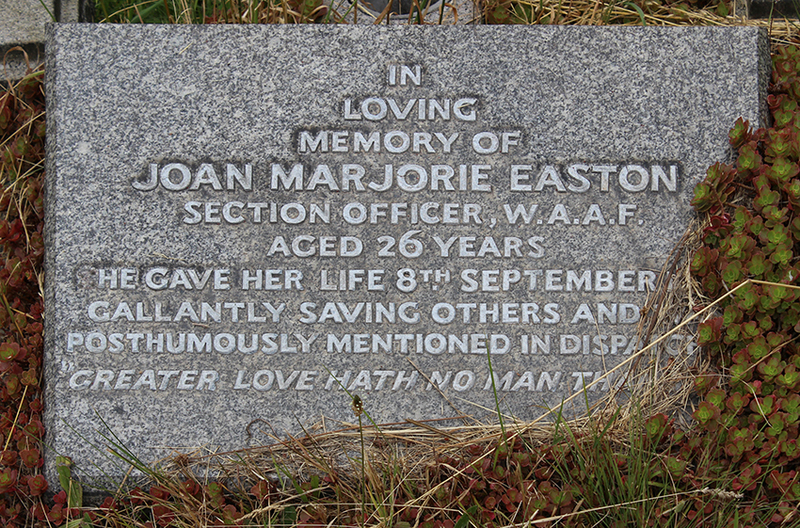 S/O Joan Marjorie Easton, WAAF, 2986 – Section Officer. Killed age 26 on the 8th of September 1943. Buried Greenwich (Charlton and Kidbrook) Cemetery, London, England.. Grave location – Sec. C. 1st Gen. Joint grave 793. F/S Francis Henry Ebbage, RAFVR 1615600 – Air Bomber. Lost without trace age 21 on the 14th of March 1945. Son of Henry and Mabel Florence Ebbage, of Whinburgh, Norfolk. Grave location – Panel 270. F/L Eric George Parsons, RAFVR 185301 – Pilot. Sgt. William Phinn, RAFVR 1684789 – Navigator. F/S Eric Ramsay, RAFVR 2205987 – Wireless Operator. Sgt. Charles Albert Longstaff, RAFVR 1595982 – Flight Engineer. Sgt. John Lawrence Beard, RAFVR 3006185 – Mid Upper Gunner. F/S John Nichol, RAFVR 1670779 – Rear Gunner. Lancaster Mk.I PB741 AA-E was struck by heavy flak over the target at Heinrich-Hutte, Hattingen, causing catastrophic damage to the port engines and wing, which broke off as the aircraft descended out of control through cloud. All on board were killed in the resultant crash. The flight engineer and air bomber have no known graves. The other five crew members are buried at the Reichswald Forest War Cemetery. Sgt. Allan Clifford Edwards, RAFVR 1163977 – Observer. Killed age 19 on the 11th of October 1941. Son of William Thomas Edwards and Annie May Edwards, of Hadleigh, Essex. 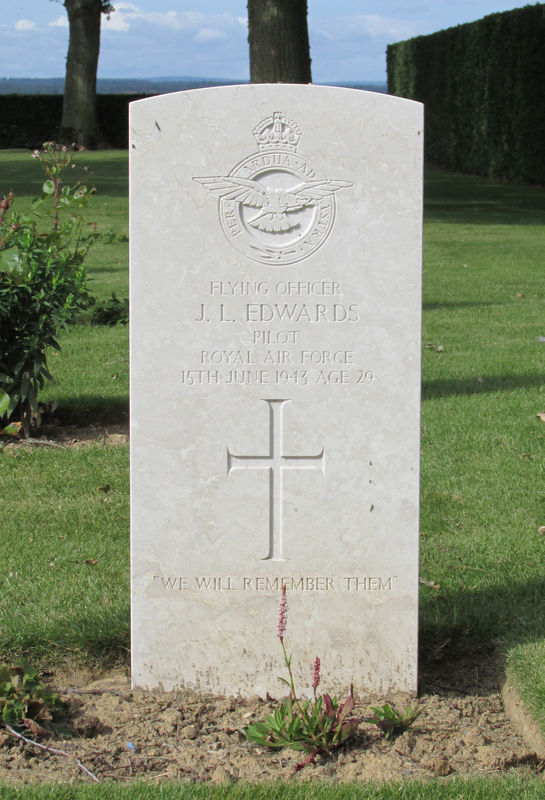 F/O John Lloyd Edwards, RAFVR 130636 – Pilot. Killed age 29 on the 15th of June 1943. Son of Walter Edwards and of Alice Edwards (Nee Lloyd), of Manchester; Husband of Irene Edwards, of Fallowfield, Manchester. Buried Bretteville-Sur-Laize Canadian War Cemetery, France.. Grave location – XXVIII. G. 7. Six aircraft were detailed to carry out the above operation with Mines of 1500lb., two aircraft returned early, one owing to intercommunication failure and the other owing to engine trouble and one aircraft failed to return. The remaining three aircraft successfully dropped their mines in the allotted area and the parachutes were seen to open. Some light A.A. fire and a few searchlights were encountered, but they were ineffective. A few enemy aircraft were seen, but no combats took lace. There was thick cloud in the mining area although visibility was fairly good. Navigation was very good. Stirling Mk.I BK646 captained by F/O J.L. Edwards failed to return. Sgt. Eric Gaul Dunnett, RNZAF NZ42380 – Navigator. P/O Russell George Kirby, RAFVR 1431495/ 134555 – Air Bomber. Sgt. Basil William Rawlinson, RNZAF NZ415558 – Wireless Operator. Sgt. Joseph Germain Fabien Sansoucy, RCAF R.66953/ C.86345 – Flight Engineer. Sgt. E.A.F. Jones, RAFVR – Mid Upper Gunner. Sgt. T. Maxwell, RAFVR 1698372 – Rear Gunner. Stirling Mk.I BK646 AA-N was shot down by a combination of flak and a Me.109 night fighter, attempting a crash landing at Moulines-la-Marche, South South West of Brettville-sur-Laize, France. With a loss of one engine and damaged ailerons, the captain ordered the crew to abandon the aircraft. All except Edwards got down safely, with Sgt’s Dunnet, Rawlinson, Jones, and Maxwell being captured as prisoners, and P/O Kirby and Sgt Sansoucy successfully evading capture. F/O Edwards did not survive and was laid to rest in the Canadian War Cemetery. Sgt. Charles Percival Ellins, RAFVR 1509658 – Flight Engineer. Killed age 22 on the 23rd of September 1943. Son of Reginald and Euletia Maud Ellins, of Cosham, Hampshire. Grave location – 18. B. 3. F/O Laurence John Kirkpatrick, RNZAF NZ414990 – Pilot. 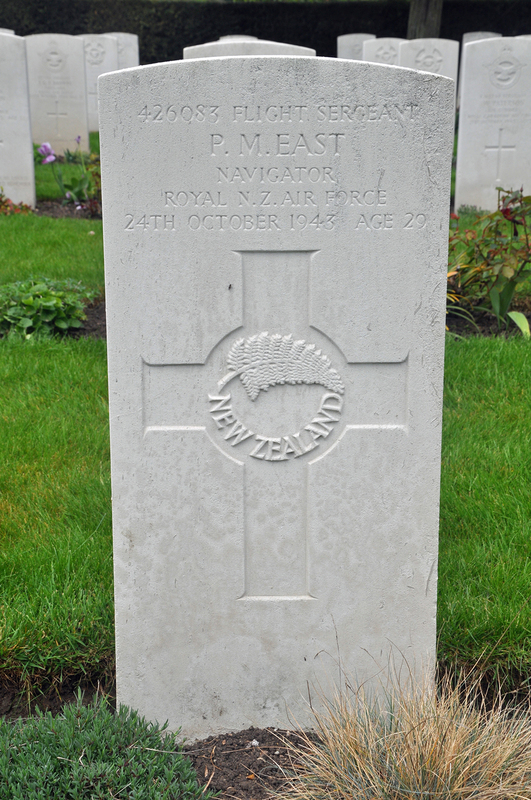 F/O Hugh Powell Sands, RNZAF NZ403287 – Navigator. F/O William Richard Allan Mason, RNZAF NZ416865 – Air Bomber. Sgt. Joseph Edwards Hoey, RAFVR 656134 – Wireless Operator. Sgt. 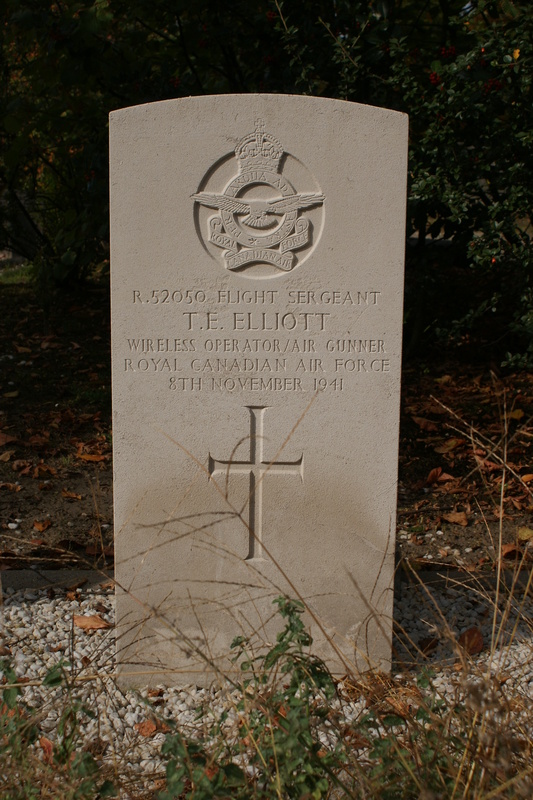 J. Elliot, RAFVR 1515956 – Mid Upper Gunner. F/S William Louis Jarvis, RAAF AUS.414691 – Rear Gunner. Stirling Mk.III EH935 JN-K was brought down between Edesheim and Knoringen, just south of Neustadt. The only two to survive the crash were the Mid Upper Gunner and the Air Bomber, who were captured as P.o.W’s. Those who died were buried at Knoringen, and later reinterred at Rheinberg, south of Wesel. F/O Thomas Isaac Elliot, RNZAF NZ421364 – Navigator. Lost without trace age 24 on the 21st of November 1944. Son of Herbert Elliot and of Ina Elliot (Nee Gernhoefer), of Awakino, Auckland, New Zealand. Grave location – Panel 262. Sgt. 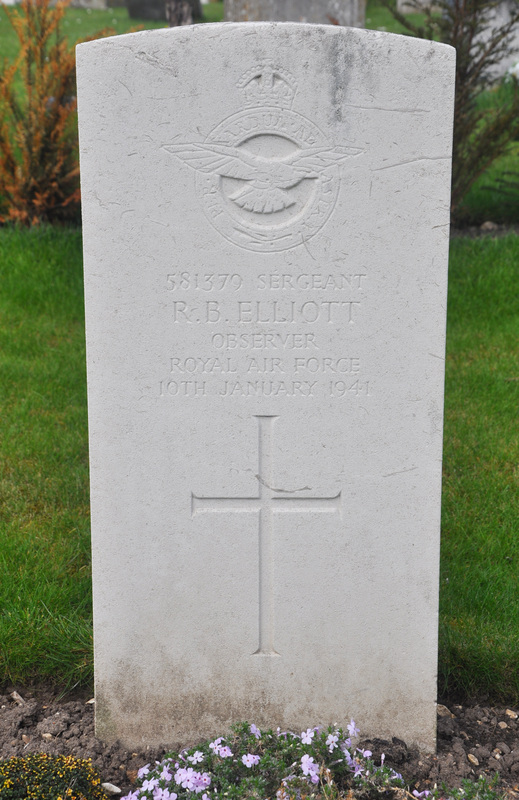 Richard Booth Elliott, RAF 581379 – Observer. Killed age 19 on the 10th of January 1941. Grave location – Row A. Grave 2. At 10.00 hours on 10.1.41, P/O McNamara was detailed to carry out a Night Flying Test on aircraft T.2550, Letter “L”. After the N.F.T. his instructions were to proceed to Bassingbourn, drop P/O Ryan and bring back a new Pilot who was taking P/O Ryans’s place. Cloud base at Feltwell was 1,500 feet and P/O McNamara was warned that south and westwards the cloud base would be lower, and , if he did not like it to return to base. Operations Room was notified of this proposed cross country flight and P/O McNamara ascertained from Operations Air Control that Bassingbourn was serviceable, and gave his approx.. time of take of as 11.30 hours. Station Signals failed to contact the aircraft after it had taken off, E.T.A. base was 13.00 hours. At 14.30 hours Control commenced taking overdue action and rang Bassingbourn on P.B.K. but did not connect until 15.25 hours when they ascertained that the aircraft had not arrived. At 16.40 hours No.3 Group informed us that the aircraft had crashed at Heath Farm, Stapleford, near Duxford, and the following personel were killed or died from injuries. P/O B.P. McNamara (Captain) unmarried. P/O A.J. Ryan (2nd Pilot) unmarried. Sgt. Elliot R.B. (Navigator) unmarried. Sgt. J. Olive (W/Operator) unmarried. Sgt. M.R. Ritchie (Front Gunner) unmarried. Sgt. R.E. Ashby-Peckham (Rear Gunner) unmarried. Seriously injured and taken to Addenbrooks Hospital. F/S Thomas Edison Elliott, RCAF 52050 – Front Gunner. Killed age 20 on the 8th of November 1941. Grave location – Row 1. Grave 5. F/S Arden Ivan Ellis, RCAF 92690 – Wireless Operator. Lost without trace age 28 on the 11th of August 1942. Son of George Lang Ellis and Margaret Ellis; Husband of Margaret Alice Jane Ellis, of Nanton, Alberta, Canada. Grave location – Panel 103. Killed age 33 on the 29th of July 1942. Son of Frank Edward and Flora Ellis; Husband of Florence Katie Ellis, of Booker, Buckinghamshire. Grave location – 15. E. 11. Killed age 31 on the 21st of April 1943. Stirling Mk.III BF506 AA-P took off at 22:05 from Newmarket. It was last heard on W/T at 03:00 signalling ‘starboard inner on fire’. Nothing further was heard, and the Stirling crashed at 03:26 at Boegballe, 15km North of Vejle, Denmark. It’s demise is reported as having been caused by a night-fighter attack. All rest in Esbjerg (Fourfelt) Cemetery. P/O William Elvin, RNZAF NZ426883 – Wireless Operator. Killed age 21 on the 12th of August 1944. Son of John Adolphus Elvin and of Nellie Elvin (nee Cairns), of Edinburgh, Scotland; husband of Elva Mahala Elvin, of Wanganui, Wellington, New Zealand. Buried Hoton War Cemetery, Belgium.. Ten aircraft set out to attack Factories at Russelsheim which are engaged in Flying Bomb production. Nine aircraft bombed the target with the aid of markers and good results were reported. A.A. defences were light, but enemy fighters were active on the homeward route, one aircraft having an inconclusive combat with a JU 88. The aircraft captained by NZ428793 .F/S. Mulcahy, C., failed to return. F/S Cyril Desmond Mulcahy, RNZAF NZ426783 – Pilot. F/O Whelan Fallon Hazard, RNZAF NZ429047 – Navigator. F/S Edward Leonard Thomson, RNZAF NZ4211036 – Air Bomber. 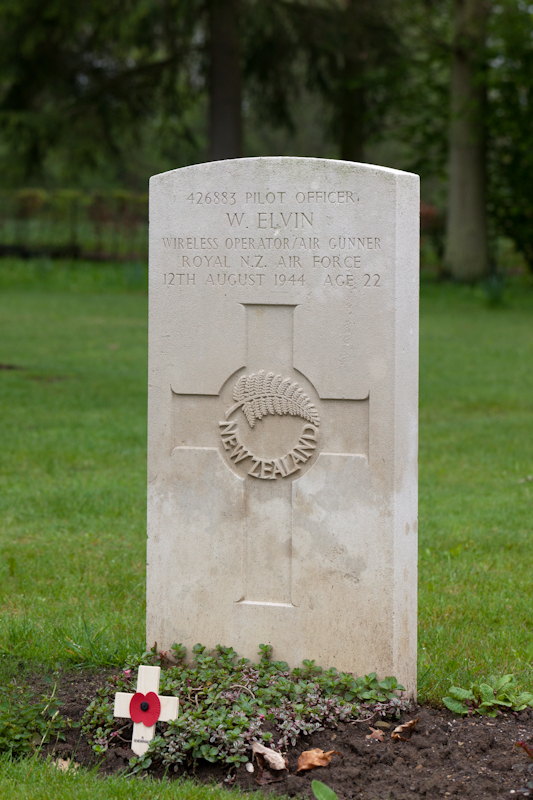 F/S William Elvin, RNZAF NZ426883 – Wireless Operator . Sgt. Robert Ronald Smithie Parker, RAFVR 1892552 – Flight Engineer. F/S Haig Douglas Johnston, RNZAF NZ426320 – Mid Upper Gunner. F/S John Herbert Wright, RNZAF NZ426209 – Rear Gunner. Lancaster Mk.I HK564 AA-P was brought down by a night-fighter, crashing at Ouren (Liege), a small village on the Belgium/German border, 9 mils East South East of St-Vith. Six of the crew were killed in the crash and were buried at Ouren. The body of F/O Hazard, Navigator, was found still in his parachute harness, suspended from the branches of a tree. He was later buried at the Reichswald Forest war Cemetery. Sgt. 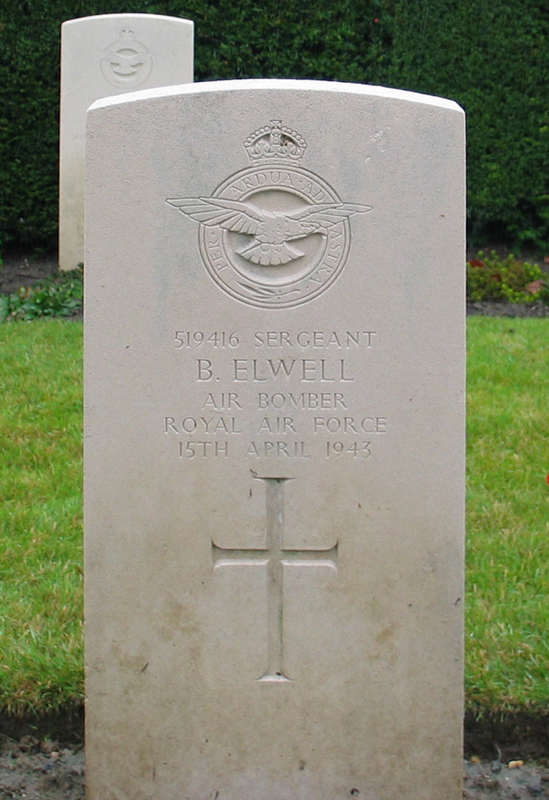 Bertram Elwell, RAF 519416 – Air Bomber. Killed age 26 on the 15th of April 1943. Sgt. Ronald Harry Emery, RAFVR 922974 – Observer. Killed age 24 on the 6th of April 1942. Grave location – Coll. grave 1. D. 6-18. Nine Wellington Aircraft from this unit were detailed to attack the above target. Bomb load of 4000lbs, 500lbs, and 250lbs and 4lb incendiaries was dropped but results were not observed. There was intense heavy flak and many searchlights were active but ineffective owing to the bright moonlight. One Ju.88 aircraft was seen near the target and Wellington III X3705 was attacked by a Me.110 near Liege without result. Weather was good and navigation by TR1335 and D.R was also good. One aircraft did not carry out it’s mission and two are missing. Wellington III X3489, captained by W/Cdr Sawrey Cookson the C.O. of the squadron, and Wellington III X3661 captained by F/S Thomas. W/C Reginald Sawrey-Cookson, RAFVR 39574 – Pilot. P/O William Finlay Budge, RNZAF NZ41977 – 2nd Pilot. Sgt. Edwin Hainsworth, RAFVR 1360695 – Wireless Operator. Sgt. Donald Percival Stock, RNZAF 1157823 – Front Gunner. F/O George Eric Mitchell, RCAF R.74313/ J.15022 – Rear Gunner. The aircraft was brought down by flak over the target, crashing into the city center where its bomb load exploded (see excerpt of the raid above). The bodies of all crew members were recovered and initially buried in the English Military Cemetery, south Cologne, then later reinterred in the Rheinberg War Cemetery. Further casualties occurred among a crowd of people watching a burning bomber (probably a Wellington) crashing in the middle of Cologne as its bomb load exploded, killing 16 people and injuring 30 more. 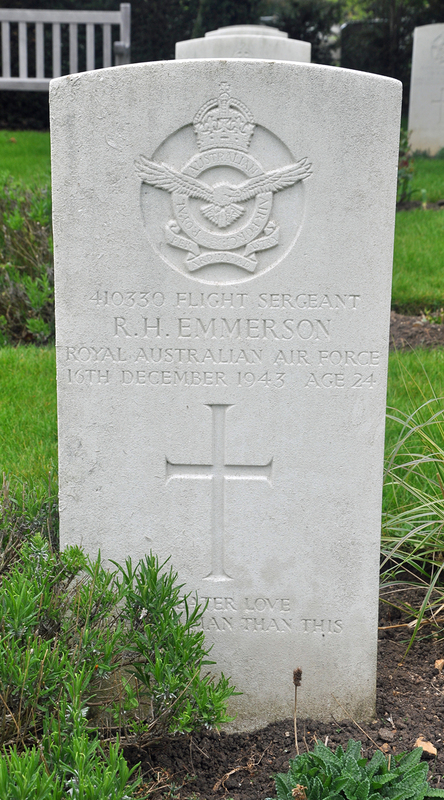 F/S Ronald Harry Emmerson, RAAF AUS.410330 – Air Bomber. Killed age 24 on the 16th of December 1943. Grave location – Grave 14148. 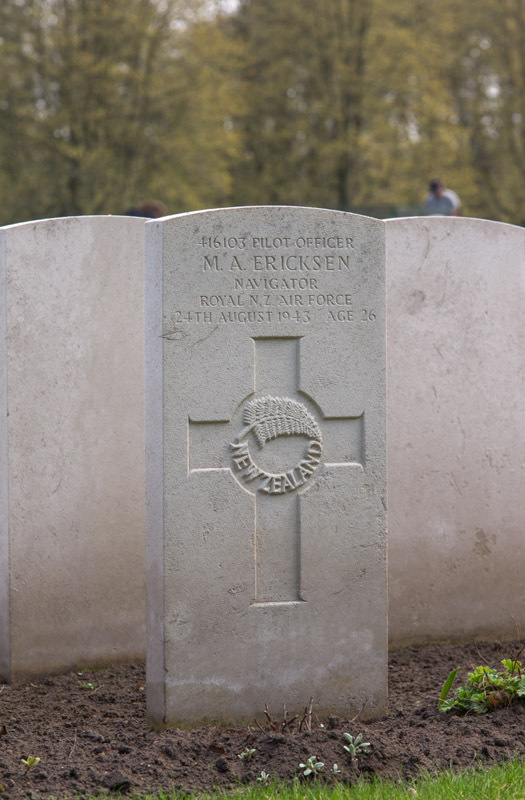 P/O Mervin Arthur Ericksen, RNZAF NZ416103 – Navigator. Killed age 26 on the 24th of August 1943. Son of William Sylvanus Ericksen and Ethel Mary Ericksen, of Dannevirke, Hawkes Bay, New Zealand; Husband of Helen Ericksen. Grave location – 6. B. 25. Son of Charles George and Mabel Evans, of Wood Green, Middlesex. Grave location – Panel 149. Killed age 23 on the 17th of April 1943. Son of Charles and Lilian Eleanor Everden, of Chatham. Grave location – 2. A. 4.